Charles R. Drew University in South Los Angeles will observe Japanese American Day of Remembrance on Thursday, Feb. 21, from 10 a.m. to 1 p.m. with an educational program on the lessons learned from the mass internment of Japanese Americans during World War II. This event will feature a video presentation by Dr. Greg Kimura, CEO of the Japanese American National Museum, and a special presentation by Dr. Thomas Yoshikawa, professor of internal medicine at CDU, followed by an open discussion with faculty, students and community leaders. A taiko drum performance will conclude the discussion, sponsored by Zenshuji-Soto Buddhist Temple, Legacy Harmony Music Series @ Little Tokyo LA, the Little Tokyo Business Improvement District, Little Tokyo Business Association. 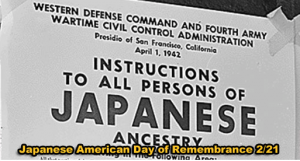 Day of Remembrance observes the anniversary of the signing of Executive Order 9066 by President Franklin D. Roosevelt on Feb. 19, 1942, which resulted in the internment of some 120,000 Japanese Americans without due process of law. The event, which is free and open to the public, will take place at the Charles R. Drew University of Medicine and Science, Keck Auditorium, 1731 E. 120th St.
CDU is a private, nonprofit, nonsectarian, medical and health sciences institution. Located in the Watts-Willowbrook area, it has graduated more than 550 medical doctors, 2,500 post-graduate physicians, more than 2,000 physician assistants and hundreds of other health professionals. The only dually designated Historically Black Graduate Institution and Hispanic Serving Health Professions School in the U.S., CDU’s mission is to conduct education, research and clinical services in the context of community engagement to train health professionals who promote wellness, provide care with excellence and compassion, and transform the health of underserved communities. For more information, visit www.cdrewu.edu/. During the past century, the Day of Remembrance has become one of the central issues dominating much of our academic, political, social and cultural events. It has become a seismographic for measuring and evaluating every minor or major, real or imaginary tremor in Nikkei life. The Executive Order 9066 seems to be a constant evaluative factor whenever we stand on the crossroads of change and decision making. Consciously or subconsciously, the internment is a guiding undercurrent in the interaction between the Nikkei and American society. The language and imagery of the concentration camps environment have become part of our daily vocabulary. Those who cannot cope with the awesome legacy, above all, the moral implication of the E O 9066 simply deny the central issue – the loss of freedome for 120,000 Japanese Americans. It is the responsibility of the younger Nikkei to prevent the isolation of Tule Laake, Topaz, Manzanar and other camps; to prevent the study of E O 9066 in an abstract void. It is the task of the youth of the Nikkei society to anchor the internment in American history and culture. This is paramount importance to the defining and understanding of the Day of Remembrance – 2013.